You recently added a NSG nameserver : great ! We can actualy specify the DNS to NSG, for instance LAN interface IP, is it what you want? I use the new function DNS addres record (in Gateway / Configure / Networks servers). So my LAN users use this host. When I connect to L2TP, these settings are unavailable. My proposal is to add the same DNS option in L2TP like in LAN. 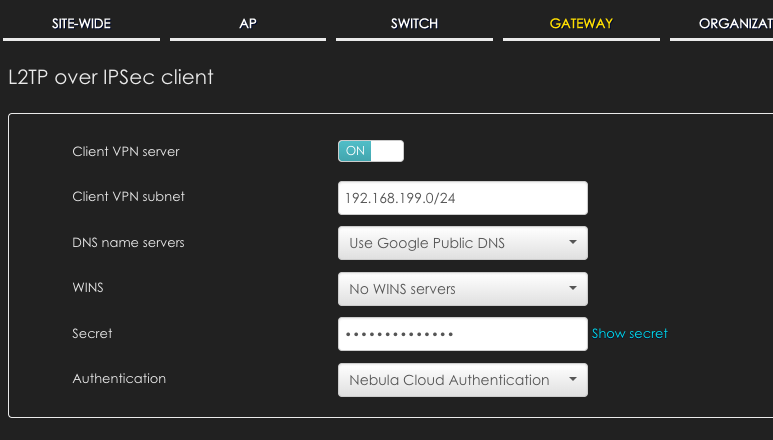 I would use the Cloud Nebula DNS first. However, please be aware that in current stage if you specify the NSG LAN gateway IP as the DNS server it can still resolve the domain name. I configured as you mentioned and it does what I want.